Welcome to the Aug 29th edition of the Old School Curated Links and News. I provide the latest round of valuable content that I’ve been reading/following as well as short updates to Old School Value you may be interested in. Our latest feature was launched last week and OSV Online continues to get better. 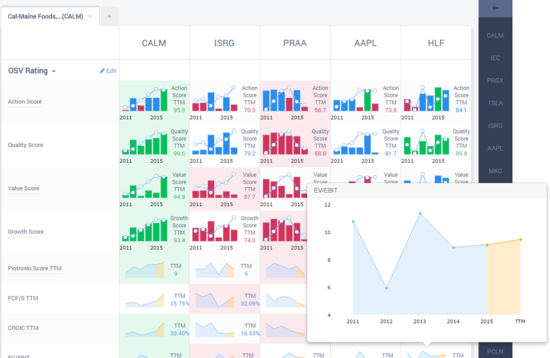 You can now use charts to compare the latest TTM value as well as historical trends to truly get a better idea of who the best in class is. You can also see it in action by going into the live demo. It’s been fun to hear from many people wanting to be part of the VIP group. I’m more than happy to reward loyal readers and followers with extra content chock full of value, not published or shared anywhere else. Of the 16,000+ people who receive normal emails from me, only 1600 (10%) are on the VIP list. Buying Negative Growth Companies with low debt, high asset value? How do people of average intelligence succeed as investors given that far more intelligent folks have underperformed the benchmark induces? What are some of the problems linked with Financial Statement Analysis?